"A well-produced, colorful visit to the work spaces and into the minds of older women artists. Highly recommended." Art is one of the oldest activities on Earth, predating science or math and it is a basic part of a balanced, healthy life. But in our culture, older women artists are not expected to be serious about art. Triptych showcases three women in their seventies who have devoted their entire adult lives to making art, and are still going strong. Lana Wilson is a mother and grandmother who has used her seemingly boundless energy to become a well known ceramic artist. Jeanne DuPrau, author of The City of Ember, is a New York Times best selling children's writer. And Nan Golub, a painter living in New York City, studied with Richard Diebenkorn and Deborah Remington and has been compared to Rufino Tomayo. "I love Triptych. What interesting and creative people." "I am so moved by this high quality film. It captures spirited years of hard earned development with lively, brilliant truth. Every artist, including writers, male or female, will benefit greatly." —Lois Sunrich, Founding Director, StoryArts, Inc.
"Triptych captivated me from the beginning. It's a joy to see people engaged in making something for the pure satisfaction of doing it well." "Pablo Casals was asked why he continued practicing the cello at age 90. He replied, 'Because I think I'm making progress.' Triptych stirred faith in me - if these women artists are still excited and growing deeper and wiser in their art at the age of 70 and beyond, I too shall forge on!" "I've felt some doubts, in my 50s, about whether I will continue to improve as a writer and have more success. Seeing 3 women in their 70s who are at the top of their game was just terrific for me." "Triptych has helped me understand a little bit about what undergirds creations that become recognized as 'Art.'" 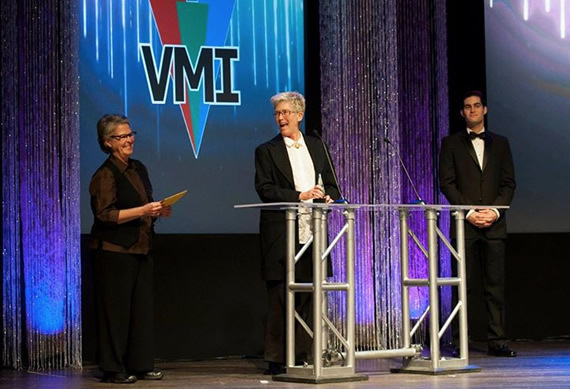 Pam Walton and Ruth Carranza receive Filmmaker Award for Triptych at the 5th annual CreaTiVe Awards gala in 2014.